Hello programming friends, it’s Andy Gesner from HIP Video Promo checking with you with another indie gem of a video! Seattle has been the unofficial commissar of new music talent in indie rock for the last several years, if not decades, and thus, it should come as no surprise that the magic in the northwestern air has persevered in cultivating yet another astonishingly exciting music molecule. The Head And The Heart are the legendary Sub Pop’s newest bunch of acoustic folk rockers that are absolutely sweeping the nation by storm with their hootenanny of a track titled “Lost In My Mind.” Shine up your tambourine and shake it along to this irresistibly infectious and timeless track. 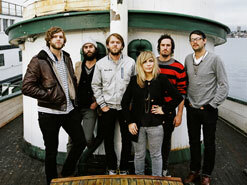 Few young Northwestern bands have risen to bang on the nation’s eardrums as fast as The Head And The Heart. Having met a little over a year ago at an open mic night, the band realized they had instant chemistry and appreciation for Crosby Stills Nash and Young. Without wasting anytime, the group recorded and released its self-titled debut last July, which became a Seattle local chart favorite. In about two months, the band went from playing small local venues to opening for Vampire Weekend at Seattle’s massive Paramount Theater. The group was quickly scooped up by indie giant, Sub Pop Records, which rereleased their fantastic self-titled record. SPIN has already named the band as one of their “35 Must Hear Acts.” The Head And The Heart are a constantly growing presence, with exclusive blogs like Brooklyn Vegan taking notice of the band as well. The indie rockers have spent this winter in fairly large theaters and halls supporting Dr. Dog and are now busy touring Europe in support of sold out The Low Anthem shows. The Head And The Heart will continue to gain momentum later this spring and summer seasons the old fashioned way – by touring the country and basking in critical praise. “Lost In My Mind” reminds us to see the beauty in all things, especially our unavoidable sadness. The track, like many of its neighbors on the album, portrays the story of a soul standing at the threshold of one of life’s most difficult crossroads. Love, loss and introspection unfold within in the track’s piercing lyrics. Textured harmonies, warm acoustic guitars, and symbiotic piano heroics weave together the layers of Americana that feel fresh and yet achingly familiar. The video follows key, featuring the band walking the snowy fields of a Northwestern night as they gather for the explosive final chorus of the song. With every second, the setting grows continually closer to night, but worry not, the darkness is replaced by aesthetically pleasing lights and lamps that reflect cozily off of the snow. The jangly guitars, choral chants, and shimmering lights shall easily be your preferred remedy or eager companion to the occasional melancholy of life. Everyone here at HIP is absolutely thrilled to be part of this high profile campaign and to once again be the ones waving Sub Pop’s flag. We’ve got plenty of copies of The Head and the Heart for contests and giveaways, so make sure to let us know and we will hook you up. If you need more info, call Andy Gesner at 732-613-1779 or e-mail us at HIPVideo@aol.com. You can also visit www.SubPop.com and www.TheHeadAndTheHeart.com to find out more about The Head And The Heart. .